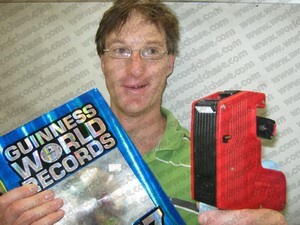 This is the story behind my Guinness World Record™ for the Most books priced in one minute. No, I'm not a retail expert who prices books by the truckload. I just love world records. I was bubbling with immense joy when I discovered I had the opportunity to make this world record attempt using world record books. That, folks, was the ultimate. The minute I heard that, I danced around squealing like a happy piglet. Do you know how uplifted I felt? Wow, it was a feeling I don't think anything else can bring. I wanted more. But right then, I had to pace myself: Alastair, I told myself, calm down. Several minutes later, my heartbeat had slowed from overdrive to very fast. Then I was able to think rationally. I was hopefully going to price more books in a minute than anyone else – oh joy. With boxes of books, I arrived at a local community hall where a photographer and TV cameraman were waiting. Feeling confident, but with slight nervousness, I unpacked the books into boxes which I spaced across three tables of equal height. I had practised, but somehow I wondered if I'd spent enough time with the books before that day. Right then, I had to produce results because I wanted good news to spread, not news of a world record attempt failure. Because of his job, the cameraman had the ability to promote my work so it was important that I gave him a reason to do so. I laid out the red pricing gun. That gun, I thought, had better work without problems. A friend had helped me arrange to borrow it from the local corner shop. I'm sure it worked perfectly when not under pressure, but for my purposes it wasn't ideal. As I practised, the pricing gun would work and jam erratically. Sometimes it would spit out more than one price sticker, other times nothing. Yes, this could have been my doing, but its always convenient to blame a tool! If the gun jammed just once, my attempt would fail because there would be no way that I could make up the lost time. Once the boxes of books had been positioned, I stood back quietly to visualise what I needed to achieve as I priced each. It was critical, so as not to upset my cycle time, that every book in each pile was overlapping just slightly in its box to allow me to flick it up as fast as possible. When I flicked each book up and out of its box to price it, it was to be laid out on the table at an angle which would form a regular pattern as in a neat display. And the books had to be equally spaced if the final array was to look smart. What's more, I had to ensure the rules were all followed with accuracy. To do this, I'd need to walk backwards because that allowed me to price each book the fastest. I needed to make sure every price sticker was firmly stuck to each book, and I had to be careful not to lose time by double handling any book by mistake. Could I remember all this and coordinate my hand movements to show it? Everyone was about to find out. I ran my hand over each box, then across the tables, to convince myself that everything was ready. That stopwatch, I thought as I flicked my eyes over to the timekeeper, was my enemy. My efforts had to prove I was capable to finishing before it reached the stipulated time. The timekeeper asked if I was ready. I nodded with hesitation. The cameraman adjusted his equipment. Without their saying a word, I knew what they were intimating: everybody is waiting for you, Alastair. And it was on! Red pricing gun in hand, I leaned forward to grab the first book. I flipped it out of the cardboard box, steadied it in front of me at an angle easiest for the gun to strike it at, slammed the pricing gun's front end into it, and smashed the priced book on the table with a terrific clap. Spectators jumped. I didn't mean to surprise them; I was just doing what I do best: working towards my next world record. My hand was back in the box, and my fingers were curling around the top of the next book. Out I pulled it as fast as my arm would do so, and as before, I brought the gun and book into contact with one another hard enough to produce a dull thud. That was book number two down. I made sure, even at this speed, that I was placing each processed book in an arrangement that would show my handiwork nicely in the end. What a blur. I did this over two dozen times, while continually yelling at myself in my mind to go faster. One mistake and I'd lose my rhythm. Worse still, I'd never be able to make up the loss of time and I could become so disoriented that my coordination would fail. My focus and concentration were as sharp as it was possible to get. The mental energy this took was huge. Would this ever end, or was I caught in a strangely suspended indefinite time warp? I kept pushing myself: faster, faster. I'd become a maniac in my own mind, full of manic thoughts about crazy behaviours at incredible speed. The blur of frantic thoughts was taking over. Then, even quicker than it had all come about, my panic ended – the timekeeper called a halt. The pricing gun fell to the table with a clatter and I straightened my shoulders. I dropped the book I was then clasping with my sweaty hand. I breathed out a very long silent sigh. I was sapped by the drain of mental energy it took to do this, and I could feel my system quickly rejuvenating itself; bringing me back to my usual mental state. It was over, it was over. The relief felt unparalleled. The witnesses commented and clapped. That was enough to snap me out of my temporary oblivion. I must have done fairly well, if they were clapping. Looking down, I saw a rather neat array of books spreading over several metres, more-or-less equally spaced, each priced in the correct way and none with a mess of gluey labels stuck to it. That pleased me, and I smiled with genuine happiness as much then as I did when my work appeared that evening on the TV news.